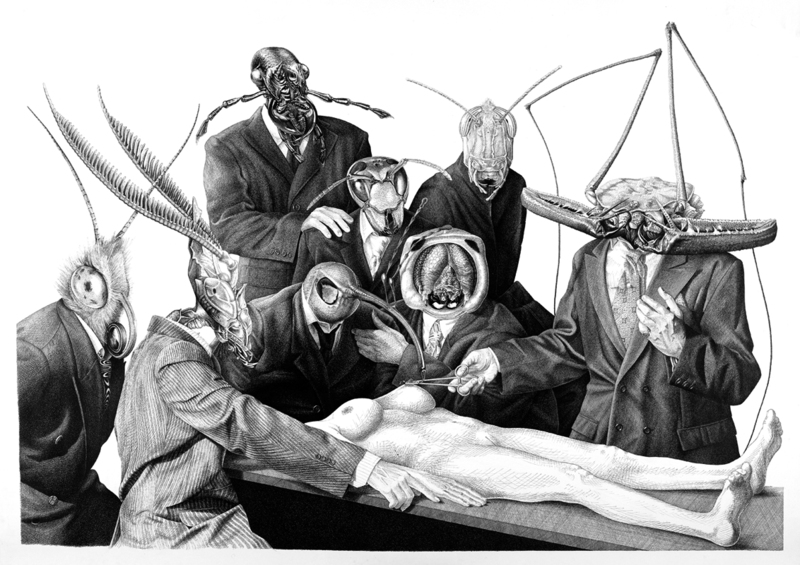 An Ending by Dan Hillier. 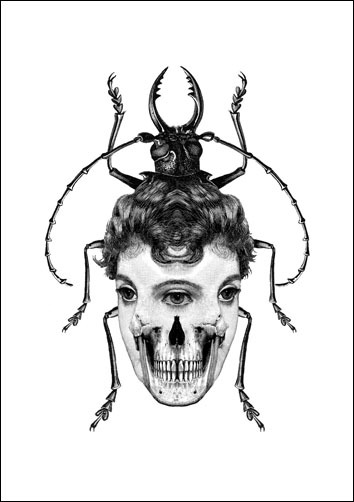 Though an accomplished painter and illustrator of original works, Dan Hillier has become well-known for his inventive collages sourced from Dover Pictorial Archives, with a dose of Photoshoppery. His Lovecraftian combinations of prim ladies and writhing tentacles has even inspired people to permanently emblazon his work on their person. But I have shown you his work to talk about another artist entirely. 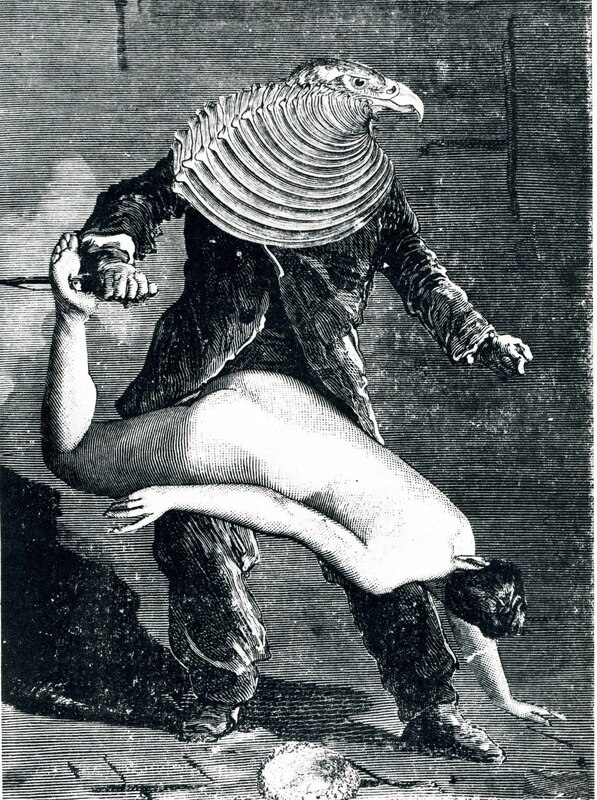 Hillier's antler-headed and octopus-tentacled creations continue a style of "artistic alchemy" that was made famous by Max Ernst and other Surrealists. Before Photoshop and scanned images, collages of this nature were made painstakingly by hand, using illustrations from penny-novels. “One day (in 1919), whereas I looked at an illustrated book of objects (umbrellas, watches, tools, clothing, etc) I was surprised to see such different things tight beside the others, things which one does not see together usually, my eyes saw other objects, I wanted to add with the pencil some lines and hatchings between the various objects so that it gives the same images that I see in my dreams.” –Max Ernst. 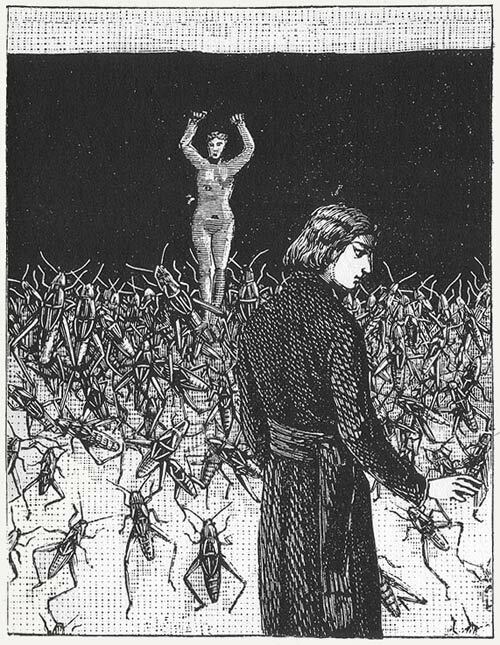 Ernst's A Week of Kindness (Une semaine de bonté) published in 1934, was filled with prim and proper Victorian lords and ladies doing properly horrible things while sporting the heads of beasts and birds. 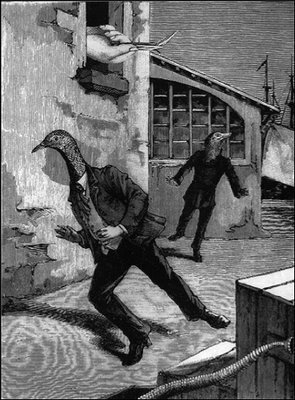 The bird eventually become his alter ego, (named Loplop), and was to be found throughout his artworks. This work in particular is based on Rembrandt's 1632 work La leçon d'anatomie du docteur Tulp. The line up here is Butterfly, Mantis, Carabid Beetle, Wasp, Weevil, Caterpillar, Locust and Amblypygi (aka tailless whip scorpion). 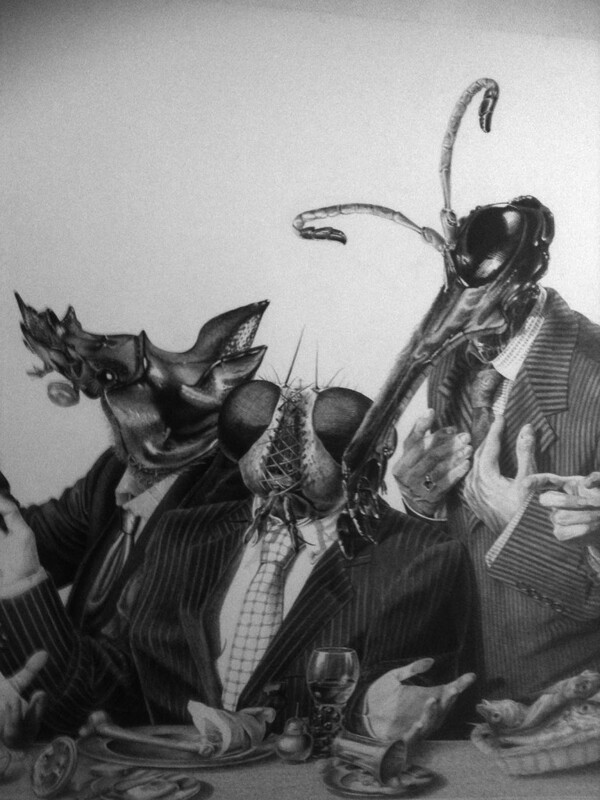 "Feast of fools" is a gigantic ongoing work in which the Last Supper (or something very much like it) is not only populated with insect-headed businessmen, but every place setting is based on still-life paintings and photographs from Caravaggio to Joel Peter Witkin. Instead of pillaging readymade scientific illustrations to create commentary, Mad Meg's work is a hand-drawn collage of scientific and fine artworks, their origins merged through her use of a monochrome palette and uniform style. Miniscule invertebrate heads are placed seamlessly on towering human bodies, giving well-to-do men of the world an otherworldly horror, their base motives laid bare on their countenances. 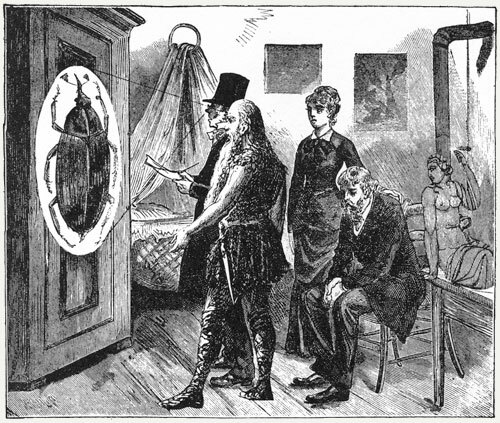 Like Ernst's lion and vulture-men, some insects have an allegorical context (locusts, wasps and flies for example). 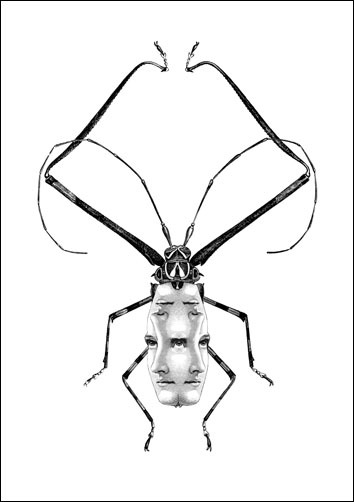 However the use of obscure invertebrates always makes me wonder: What does an Amblypygi head signify to the general public? 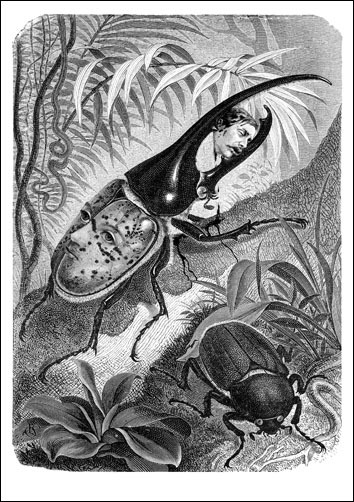 Will greater knowledge of obscure invertebrates create new allegories beyond the simply grotesque? I'd like to hope someday that would be the case. 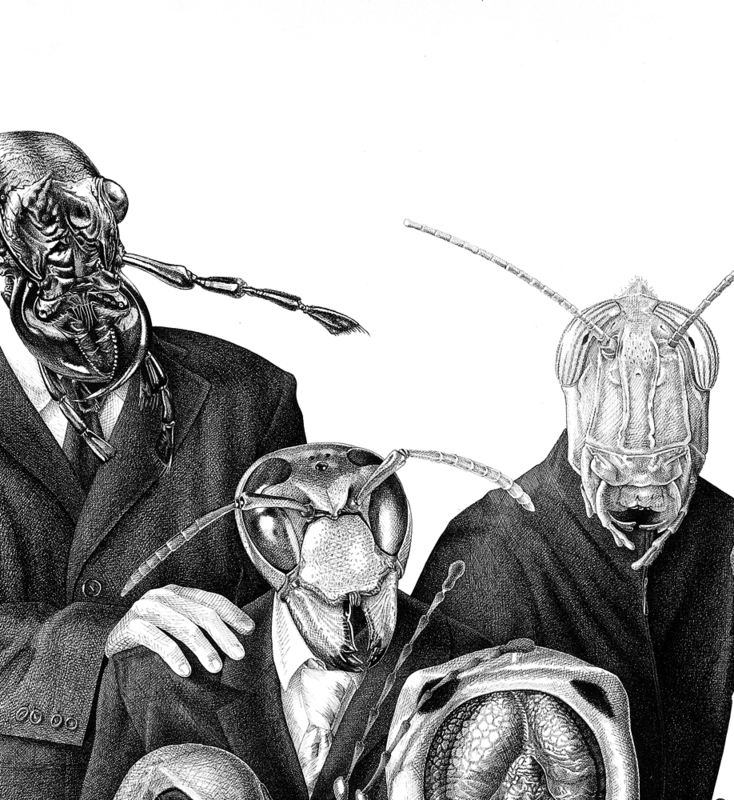 This entry was posted in art and tagged Amblypygi, art, beetle, cockchafer, collage, cricket, Dan Hillier, engraving, insect, locust, Mad Meg, Max Ernst, Rembrandt, stellanova, wasp, Weevil. Bookmark the permalink.